There are many folks that feel if they are going to embrace a healthy lifestyle then they will have to stop eating snacks and fun foods. With football season already started, and two important holidays coming up, everyone will have times when they want to enjoy delicious treats with their friends and families. 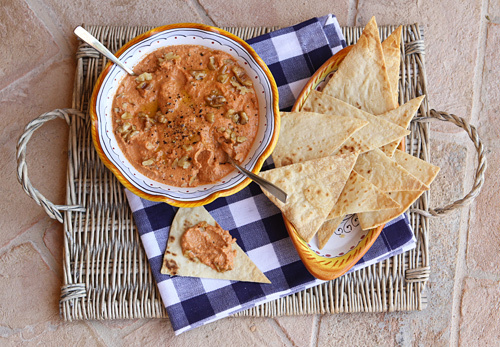 Luckily, you can have fun, tasty snacks that are very healthy for you too such as this roasted red pepper dip. I have made red pepper dips in the past, and many included some type of light cream cheese or other dairy product. 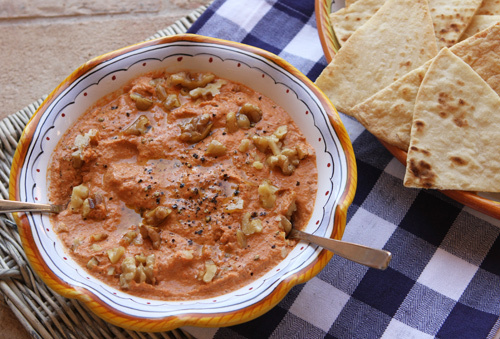 This dip basically contains just sweet roasted red peppers, toasted walnuts, wholewheat bread to thicken it, and a few seasonings. The dip turned out creamy and smooth, and I found the flavors even improved the next day so it is a great choice as a make-ahead party option, or even for football tailgating. I served my dip with crisp celery sticks and toasted pita chips and the dip was thoroughly enjoyed by all. Whole wheat bread is used to thicken the dip instead of the usual dairy options which adds fiber, as well as other nutrients which reduces the risk of coronary heart disease, constipation and helps to maintain optimal weight. Walnuts have a significant amount of alpha-linolenic acid (ALA), which is an omega 3 fatty acid that helps to protect the heart by reducing cholesterol, and reducing nflammation. Walnuts are also a good source of disease fighting antioxidants. A great dip to serve with toasted whole wheat pita chips or raw veggies. Cut the tops off the peppers, and remove the seeds and membranes. Cut the peppers into three pieces lengthwise and place them skin side up on a foil lined baking sheet and place under the broiler. Cook the peppers until the skin has charred and then place in a plastic bag and let rest 15 minutes. Place the walnuts on a baking sheet and toast for about 8 to 10 minutes. Tear up the whole wheat bread and place in a bowl with the water. After 10 minutes, drain the bread and squeeze to remove most of the water. Remove the charred skin from the peppers and place the peppers, 3/4 cup of the toasted walnuts, garlic, bread, balsamic vinegar, and lemon juice in a blender and pulse until smooth. Add the pepper sauce, olive oil, salt and pepper and pulse again. Place the dip in a bowl and garnish with the remaining chopped walnuts and a drizzle of extra virgin olive oil. Serve with toasted whole wheat pita chips, or raw pepper, celery, or carrot sticks. Thank You for the black bean recipe. I started buying the dried black beans to CAn instead of buying them because of the high sodium content. I will now use your recipe because of added ingred, for flavor.